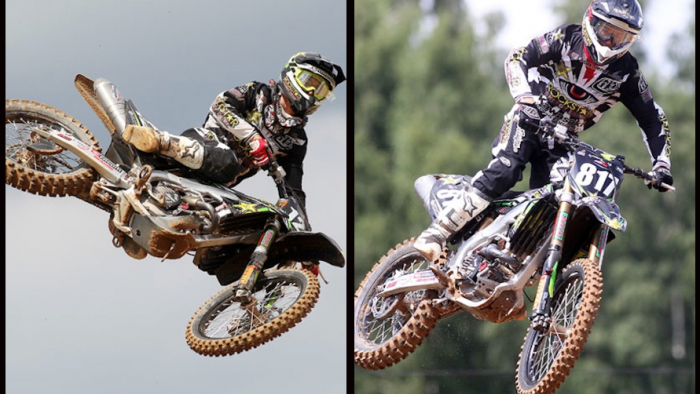 Dylan Ferrandis finished sixth overall in the eleventh round of the MX2 Motocross World Championship at Kegums in Latvia, and offered to the Rockstar Bud Racing Kawasaki its best result since the French GP. With a tenth overall, his best ever GP result, Jason Clermont completed the good weekend of the team. The French teenager had set third fastest time during the practice sessions, and was confident for this weekend. But he crashed early during the qualification race and had to be content with twenty-second choice of start gate for the GP motos. His first start was average, and suffering from arm pump in his forearms he raced on the edge of the top ten all moto. But Dylan settled quickly into a better rhythm in race two for a strong ride to sixth place in the moto and the GP overall. Although he had never raced on the sort of track he faced in Latvia, Bud teammate Jason Clermont had his best GP result to date. Qualified in thirteenth he took a great start and then maintained eighth place for most of the first moto before the demanding track forced him to surrender two places to more experienced rivals in the closing laps. Another determined ride in race two, earns Jason the first-ever top ten GP ranking of his short GP career in his fifth race with the team. The team will now move to Hyvinkää (Finland) for the third and last back-to-back races in the Baltic’s.